Holy...! That is one heck of a terrarium you're planning there. It sounds like you've got enough stuff planned out to make your own miniature ecosystem! Well, a quick note that I'm sure someone whose post I have not read has stated already, if the water is moving, there should be no problems with algae and other nasty things growing in it. Your plan doesn't say you're planning on putting any Utricularia or Aldrovanda in it. Well, I promised I'd make updates as I went, so here's the next progress report. It's been a busy couple weeks between work and family, so I haven't made as much progress as I like, but there are a few pictures below. 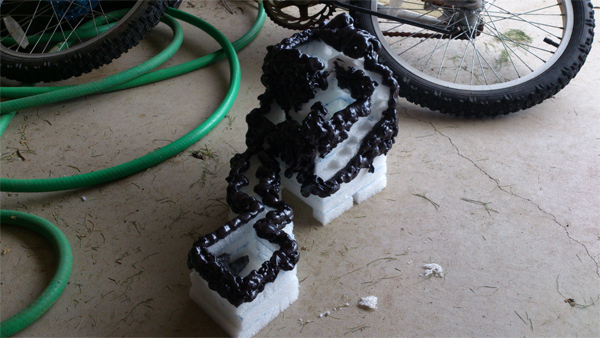 The first two are after I attached a tube guide to the back of the waterfall, and tore away and cut away pieces of Styrofoam to make the shape more organic. After that I used Great Stuff Expanding Foam, which is essentially an expanding sealant but that I used for aesthetic purposes. 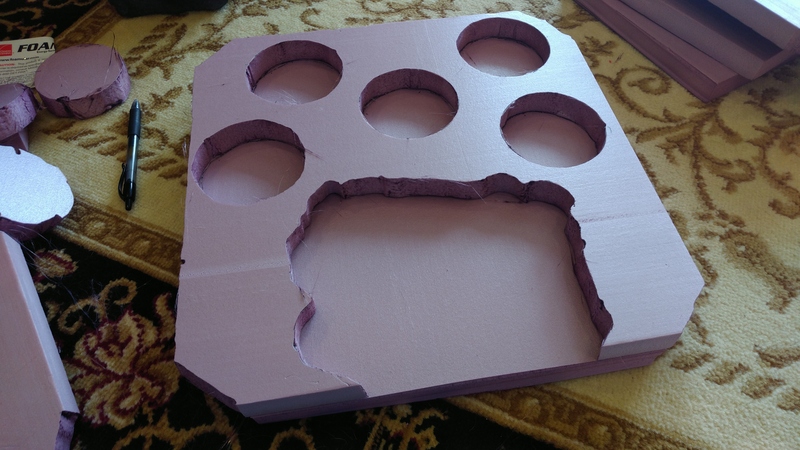 This was sprayed along the tops of most of the ridges to create a more rounded and organic shape and get away from the sharp edges that are inevitable with just Styrofoam. I was a little scared of the stuff after reading all the warnings, but I did it outside, upwind, with lots of safety equipment, and was having a great time with it by the end. Working with it was like a game; anything you did with the trigger took about 30 seconds to work its way to the end of the spraytube. The last picture is after two coats of grout. The grout is being used as both a base sealant for the wet areas and as a smoothing (and coloring) agent for the rest of the structure. The first few coats are white, but I'll be adding grey (and maybe some red) coloring for the last one or two. Then it's on to painting (maybe), spray sealant, and silicone for the ponds. I'm finding it very difficult to get grout into all the nooks and crannies as the lakes are very small and relatively deep. I'm concerned that I may need to redo the whole thing. Here's a somewhat unrelated question for you guys. Any suggestions on feeding? I'd love to be able to provide live food for a variety of reasons. On the other hand, I'm not sure I'm up to chasing live flies around the house like I did as a teen =P. I considered purchasing feeder crickets, but they seem a little big and I'd be concerned about them reproducing and taking over the tank (though there's no food in there for them I guess). Is there a better method? Are there feeder insects one can buy that don't fly (so they won't get out)? I'll post again in a week or two. So this took me a bit longer than I expected. My computer went down and life got otherwise busy, but I've still made some slow progress. First, some pictures of the waterfall. After several more coats of grout I hit the whole thing with a couple coats of textured indoor spraypaint. This was followed by about 5 or 6 coats of clear acrylic to act as a general sealant, though I still have a couple tubes of silicone coming in to use in the water areas. I tested it with just the acrylic anyway and had only a few leaks, so I'm taking that as a good sign. I have most of the components required for my auto-watering system. I talked to a sales rep at HorticultureSource.com and they recommended a air splitter that they felt would hold under the additional pressure. That will allow me to run a 1/2" line from a pump in a water bucket, up through the bottom of the terrarium where it will split into six 1/4" lines under the soil tray. These will run up the sides of the soil tray and top-water at the base of each plant. A timer will be connected to water for around 1 minute per day, I think. Lighting is still up in the air. I cannot, for the life of me, find a hood that will fit in the space I have available. I have somewhere around 12” in length at 6” in height (or 13” in length at 5” high) and would like to keep the width to 8” or less. Most hoods clock in at 18" as a minimum. So I think I'm going to go to Home Depot, pickup a couple bases, and try to build a hood out of, I guess, aluminum foil...guess it's time to hit the internet for a tutorial on how to do that. I'm excited about the progress, but also a little saddened by the timing. It will likely be September by the time I'm ready to order the plants in; almost time for them to go into dormancy. I'm almost tempted to wait until late winter and buy them then. Or am I remembering correctly that most plants sold online are younglings and probably okay skipping their first dormancy? This is starting to look fantastic! I don't think you needed to layer the Great Stuff with quite so much sealant. A few layers of silicone is all that is necessary. The reason I put so many layers of acrylic on is because of the size of the waterfall. If this were a large project where I could see into all the nooks and crannies of shallow lakes it wouldn't' be such a problem, but as it is there are areas in the lakebeds that I can hardly reach. I ran a water test after my first coat of silicone and found that there is apparently a rather large hole at the bottom of the middle lake. This isn't surprising to me; the little nub of the lake sticking out towards the front of the waterfall is so small that I simply cannot reach into it to seal; I'm trying to do it with a paintbrush. Also, the great stuff was more of a modeling agent than a sealant. I didn't really use it underwater at all. I came across something today that may have solved a little problem I've had since the beginning. Initially I wanted to try and find tiny little LEDs to hide within the waterfall for nightime lighting, but couldn't do so. I'm not sure the best way to include them even if I had, but I now have a much better idea. Had anyone here ever worked with bio-luminescence in a terrarium setting? I did some Googling today. There are small organisms that can live in freshwater that bio-luminesce at night in response to water movement. I'm not sure what their nutritional requirements are, though, or how they'll interact with the pump. Has anyone used them in a waterfall before? That covers nighttime lighting in a much more natural way than LEDs and will look awesome. Assuming it will work out I'm also considering getting some bio-luminescing mushrooms. I read that you start them on a log, but do they stay there? Or am I in danger of them overrunning the whole terrarium? I'll certainly continue to research online, but I'd love to hear tips from personal experience. It's been a while, so I thought I'd post a quick update. This project has been set back. 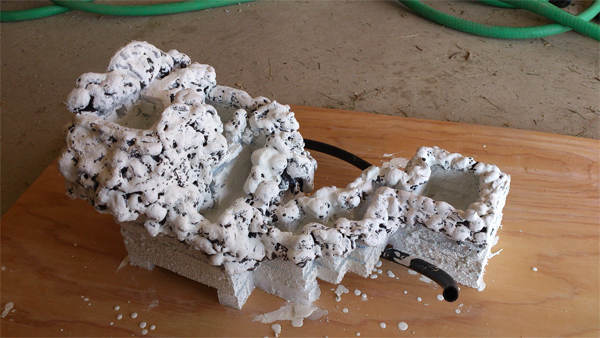 After applying several coats of silicone my waterfall was still leaking in many places. 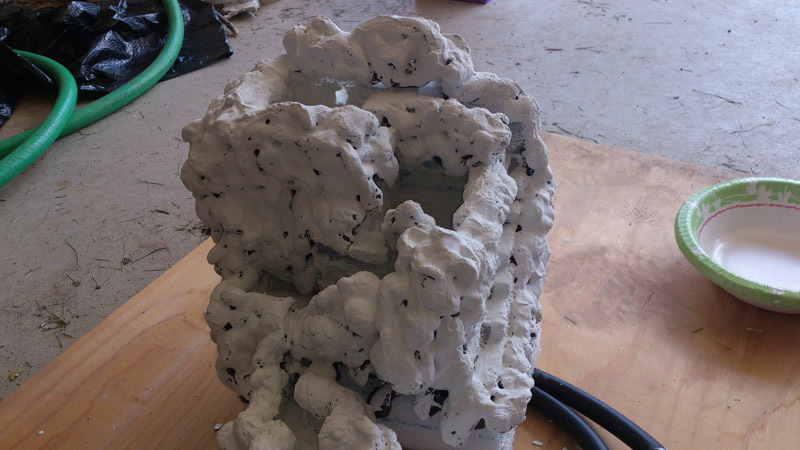 I had used more porous Styrofoam than I should have. I had also made the lakes very deep and thus harder to reach into; this was especially problematic in the narrow passageways of the streams. The very small, 1/2 inch jutout in the mid lake was a big problem too. This prevented me from being able to properly cover and seal. In the end, I think I'm going to need to scrap this waterfall. I'm looking at this as a learning opportunity more than a failure, and am getting ready to try again. This time I'm going to make shallower lakes, a flatter stream, and less intricacies. I also may avoid the expanding foam; This is for financial reasons as much as anything, though the foam did close off areas that I had wanted to be open. I'm going to try thick grout in place of the foam this time. I've decided on a few improvements too. The stream will be shortened, as I could hardly fir the waterfall into the terrarium last time (between the measurement errors, expanding foam, and additions, it was about an inch longer than expected and the terrarium was smaller than expected). I'll also run the output tube up the back of the waterfall into a cave that will spill into the upper lake; this provides better sealing and a better appearance than just fountaining the water up the bottom of the lake. I'm going to get rid of the steps, too, I think, as they just didn't look good last time; though I may just move them to a lower tier. So what's the record for thread necromancy? But with the kids getting ready to head off to college, my finances stabilized enough to give up nights/weekends work, and some other family responsibilities gone, I'm finally seeing the light at the end of the tunnel. - Having a professional made waterfall avoids all the pitfalls I ran into before. Building my own was fun, and I'd try it again, but not until I have more free time. 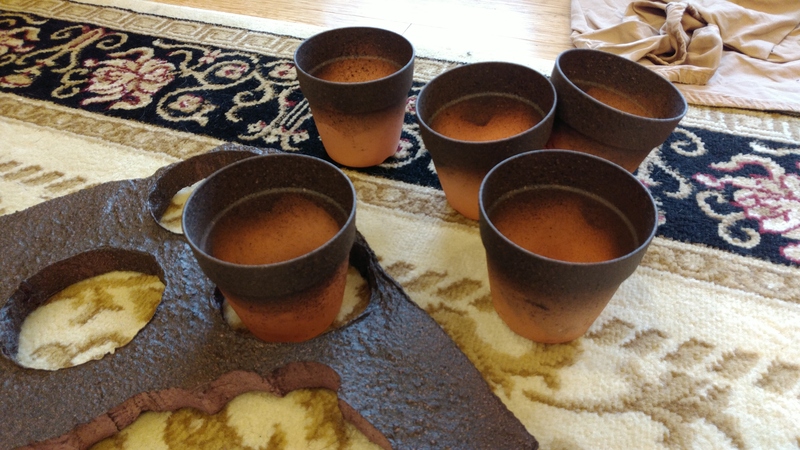 - Having pots sunken into a foam base allows me to easily remove them to handle dormancy. I have a backup pot or two with miniature decorations to put in their place when they're gone. - Having the pots and base painted the same, to match the waterfall, helps make it look like a dirt ground, especially with some moss on top, without risk of insects, weeds, bacteria, etc. - Running the grow light at night provides ample light, while the LED strip provides a much more visually pleasing light to enjoy the plants during the day. I purchased a prebuilt waterfall. 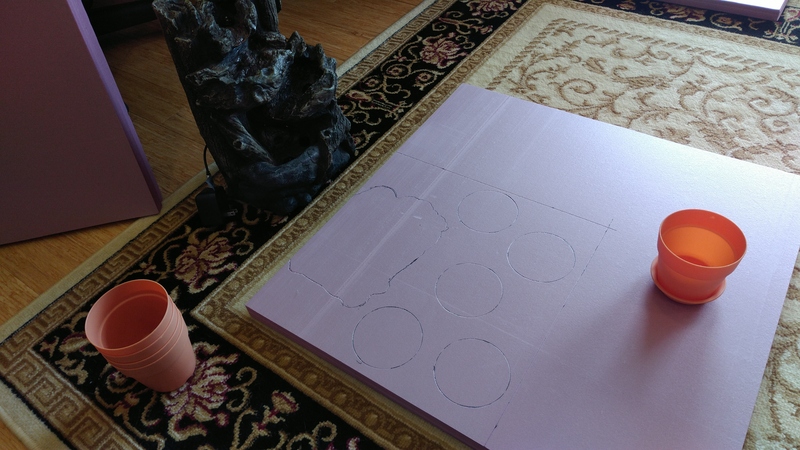 Then grabbed 3 sheets of 24"x24"x1" pink foam at Home Depot. 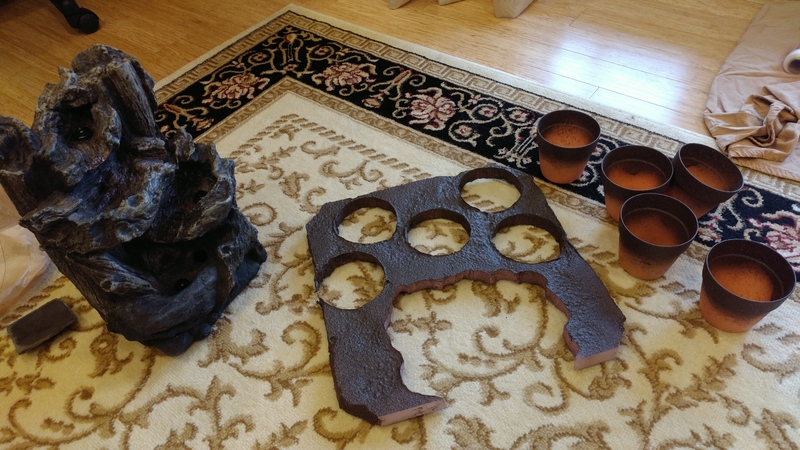 Also ordered Axe Sickle 3.9" pots. These pots took a while to find. The tray is smaller than the top, which allows it to fit into the same size cutout. 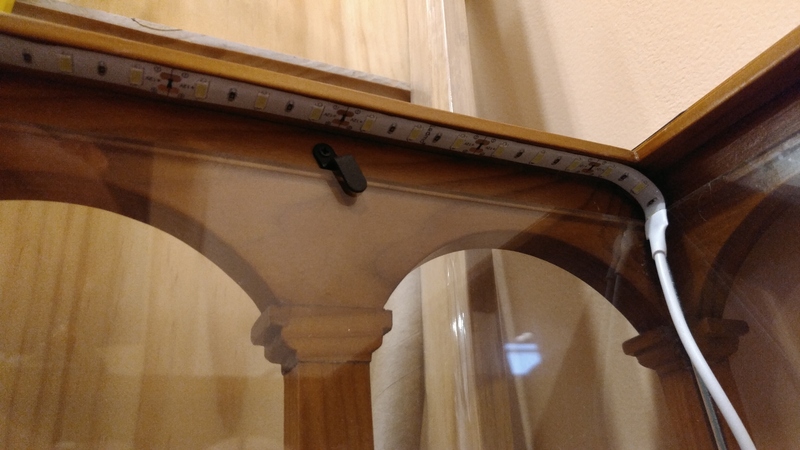 Meanwhile, the top is shelved, making it easier to keep level in a cutout designed for it. I also needed to pickup my grow light, LEDs, smart plugs, and a can of Rustoleum 'stone' spray paint and a polyurethane topcoat from Home Depot. Shopping done, I started with the foam. First I cut the foam to fit the terrarium. Then I set the waterfall on top of the first foam board and traced it with a pen. I did the same with my pots, upside down. Using a foam cutter I cut out the waterfall and pot outlines a little bit big. This allows everything to rest on the next level of foam. 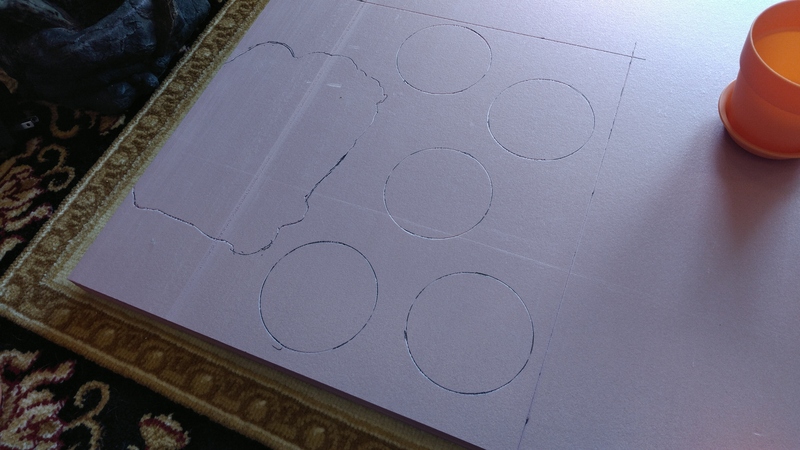 I then cut out the pot outlines on the next two boards. Placing the three boards on top each other in my terrarium, with the pot saucers resting on the terrarium floor, I insured that everything fit well. 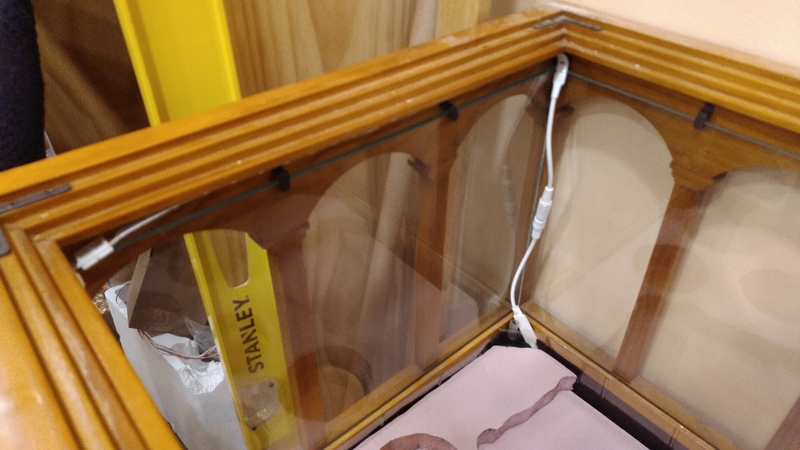 Unfortunately, the waterfall was a little tall, and hit the top of the terrarium, so I had to cut the middle foam board to let the waterfall rest on the bottom board. Next I hit the top foam board and the tops of the pots with the paint. 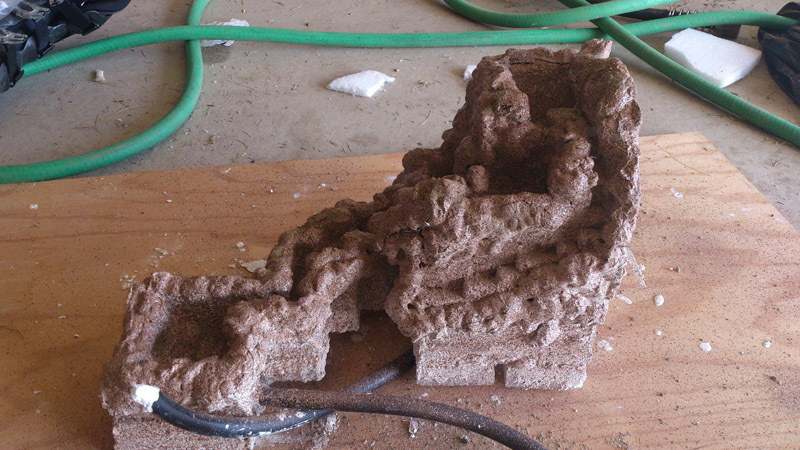 This worked great on the pots, but the paint solvent ate into the foamboard. While unexpected, this ended up giving it a nice, organic look. 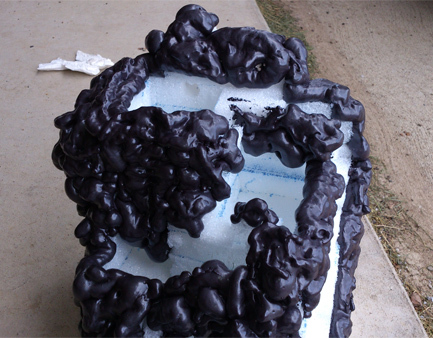 However, it also made the foam weak and the paint was easy to rub off. So I sprayed 2-3 coats of clear poly over both the foam and the pots; the former to strengthen it and prevent shedding and the latter to insure it was nonreactive with the soil. This gave everything a nice 'dirt' look. Then on to the lighting. I ran the LED strips just under the top edging of the terrarium, out of sight from both above and below. This was hooked to a RF remote, and the power cord brought down the back corner and out a hole in the terrarium floor. There I hooked it into a smart plug. I may eventually paint this white wire dark brown, but I'm going for simple right now just to get things up and running; then I'll work on enhancements. Meanwhile, I cut two pieces of plywood large enough to rest on the terrarium top shelf. I cut a hole in each, the first just larger than my grow light, and the next about 1" smaller in each direction. I screwed and glued these boards together, hit them with some white paint, and then set my grow light on top; it was a quickie job that doesn't look great by any means, but works for now. The grow light went into another smart plug. - Wait for my sphagnum peat moss to come in and mix it with Perlite to fill the pots. - Narrow down my list to 5 plants and order them in. - Start the light schedule running and begin watering and enjoying. - Do a final post here with photos of how it all looks after coming together.